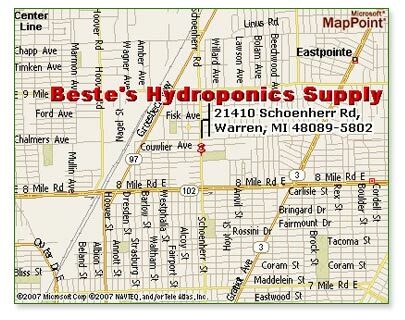 Bestes Hydroponics Supply is the hydroponics leader in Michigan. When you want to create the ultimate indoor garden Bestes Hydroponics Supply has all the supplies and equipment yo u will need to make a successful garden. Items like nutrients and additives, grow lights, water filtration and much more are all available at Bestes Hydroponics Supply. Do you live in Warren, Livonia, Westland, Canton, Garden City or any other Southeast Michigan city? If you do and you need hydroponic supplies, Bestes Hydroponics is your place.